Habitat: Common Vervain is native to Europe. Nowadays, the plant is widely naturalized all over the globe. It grows on waste places and prefers moist, well-drained soils. 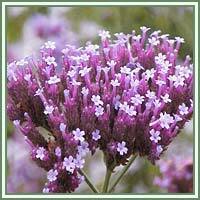 Description: Verbena is a perennial plant growing up to 90cm in height. It has a woody stalk and pale green, hairy stems. Leaves are green, soft and hairy, with the lower ones being obovate, deeply divided and stalked and the upper ones being lanceolate, slender and toothed. Flowers are very small and blue in color. They appear on a long, slender spike. Fruit is a cylindrical nutlet. Parts used: Leaves, flowering heads, stems. Useful components: Alkaloid, bitters, glycosides, tannins, volatile oil. 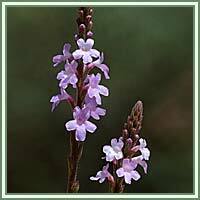 Medicinal use: Common Vervain is considered to be a very powerful relaxant, diaphoretic antispasmodic and emenagogue. It can be used in the treatment of depression, melancholia, asthma, migraines, insomnia and nervous cough. It can be very helpful in different cases of liver conditions, jaundice and gallstones. It is also considered to be an effective remedy for infected gums, tooth decay, halitosis and tonsillitis. Used as a poultice, Common Vervain can be applied to insect bites, sprains and bruises. As an ointment, it acts as a beneficial remedy against eczema, wounds, weeping sores and painful neuralgia.